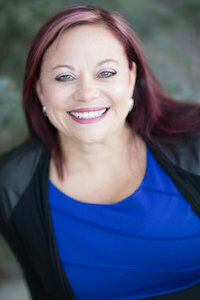 EFT or Tapping is a powerful energy clearing technique that facilitates the release of such things as negative emotion, limiting beliefs, negative self-talk, self-doubt, physical pain and a host of other unwanted things that keep us from living a full, abundant life. It also has the astounding ability to help reprogram the subconscious mind so that we can be congruent in mind, body and spirit with what we are desiring to create in our lives whether it be success, abundance, health, harmony or peace. The above video is a short introduction to the tapping points, tapping sequence and what to say while you are tapping. Tapping is a very forgiving process so don’t get too hung-up on wording, tapping order or any of the specifics. Intention and focus are the most important things so try to tap in a quiet place where you can concentrate. A generalized Tapping Script for stress relief is at the bottom as an example. 1) Rate your emotional intensity, charge, or physical symptom around your issue from 1-10 with 10 being the highest. 2) Start with the Karate Chop point and create a Set Up Statement that consists of an “Even though” + The Target Issue + an Affirmation. 3) Repeat the Set Up Statement 3x while gently tapping on the Karate Chop point. 4) While verbalizing Reminder Statements, tap through the points on one side of the body or both. We use Reminder Statements to keep us focused on the issue while we’re tapping. Reminder Statements may simply state the problem (i.e. “this stress” or “this painful neck”) or address various aspects of it. 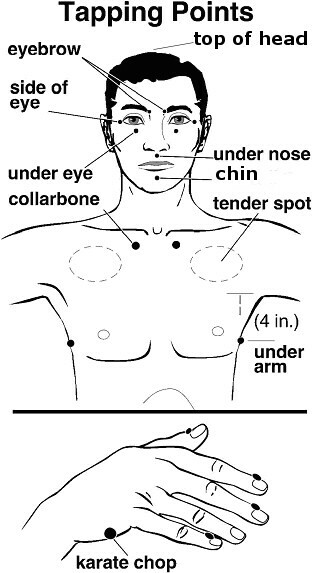 When performing an EFT round use your fingers to gently tap on each point approximately 5-7 times each. 5) After each round take a deep cleansing breath and take note of your emotional or physical intensity . There is no right or wrong here– Whether it’s decreased, increased or stayed the same it is just information that tells whether we’re on target, need to hone the focus or search further for the core issue. 6) Repeat sequence until the charge is at a zero or low enough that you feel relief enough to move to another point or take a break. KC: Even though I have this stress about _______ and I feel it in my _______ I deeply and completely love and accept myself anyway. KC: Even though I feel this anxiety about _________and it’s affecting my life by ___________ I respect and honor how I feel. I accept who I am and all my feelings anyway. EB: I am so stressed out right now. SE: And I feel it in my __________. UE: It feels like a _____________. UN: I am so stressed out by this _________ problem. Ch: I am so anxious about this ________ issue. CB: I am so uncomfortable and stressed. UA: It’s affecting my ____________. H: I’m so tired of having this stress. EB: When am I ever going to feel peaceful again? SE: I can’t see an end to this. UN: All these stressed-out feelings in my ________. Ch: I am wound so tight. CB: I just can’t relax. TH: All these stressed and anxious feelings about __________. Take a Deep Breath, Reassess and Rate Emotional Intensity on the Issue. Repeat if necessary until Intensity Decreases to Zero ( or 1 or 2). After your intensity drops to where you’re feeling quite a bit of relief it can be helpful to introduce and end with a positive round. Positive rounds do not need to start with a Set-Up Statement– Just tap through the points. EB: I embrace this new sense of peace. SE: I feel so relaxed and balanced now. UE: I allow my body and mind to relax. UN: I release all the tension in my body and mind. Ch: I enjoy this sense of letting go. CB: I feel so relieved. UA: I am coming back into balance and peace. TH: So relaxed and peaceful now.